Sam Zurier was kind enough to write up his notes of the recent meeting regarding Nathan Bishop’s progress with regard to renovations. 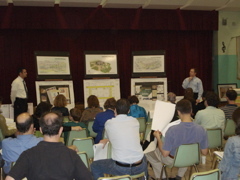 On Wednesday, May 7, the New Nathan Bishop’s architect, Scott Dunlap of AI3, made a presentation about the progress of the school. Around 65 interested neighborhood members attended. AI3 has completed its plans, and the City has hired a contractor with whom AI3 has prior experience. Work is scheduled to begin this month and completion is projected for mid-July, 2009. Although the building will retain its shell and be renovated, Mr. Dunlap emphasized that the project amounts to a total gutting of the building’s interior, through which “no surface will be untouched.” The renovation will make the New Nathan Bishop a “high performance school,” which means it will achieve a series of performance standrasd for energy efficiency, non-toxic materials, water recycling, limited construction waste, efficient use of daylight and so forth. The building also will incorporate a number of technological advances, including integrated whiteboards, streaming videos, full screen internet displays, and wi-fi access. The exterior of the school is also scheduled for improvements. There is a new entrance that is expected to be more “welcoming”. The brickwork will be cleaned and landscaping will be added. Mr. Dunlap discussed the improvements planned for the school’s common areas. The libarary/media center will be a focal point in the front, central part of the building, occupying two levels. The auditorium will not restore the retractable curtain from the building’s early days (a maintenance burden), but will have an integrated control booth and a restored coffer ceiling and moldings. The gymnasiums will have more usable space as the balconies will be removed. It will be brighter with the addition of skylights. There will be a security system to permit public access to these common areas after school. In order to encourage calmer students, the classrooms will be arranged in “pods” so that circulation around the building is greatly reduced. On a similar note, each classroom will have its own water fountain and sink to reduce student trips to the hall. The cafeteria will retain its prior limited space, but new materials and surfaces will help it to be brighter than before. There also are plans to control construction noise and disruption, although a certain amount is inevitable given the precise schedule. The contractor will be liable for actual damages (not liquidated damages) in the event of delay. It will be up to the School Department to maintain the building after it opens. The new regulations issued by the Rhode Island Department of Education require districts to allocate 2.5% of construction cost each year for maintenance, but this will be a challenge for Providence. ESPEC plans to hold another community meeting in around two months to discuss the program that will be offered inside this new building. Two upcoming events will benefit the Mount Hope Learning Center. TONIGHT: OOP’s Downtown Store at 220 Westminster will donate 15% of all sales made between 5:00 and 7:00 p.m. to the Learning Center and the George Wiley Center. Here’s a flyer describing the event. Saturday, May 10, there will be a Plant and Bake and Yard Sale at the Learning Center, 140 Cypress Street, from 9:00 a.m. to 4:00 p.m. Here’s a flyer describing the event. 7 p.m. at Dr. Martin Luther King Jr. Elementary School, 35 Camp St.
Two years after the closing of Nathan Bishop Middle School was announced, renovation work is about to begin to create the new Nathan Bishop! We expect the construction contract to be awarded by May 1, and work to begin immediately thereafter. At our request, and with the assistance of Councilman Cliff Wood, the City of Providence has invited the project architects, Architectural Involutions (AI3), to present their final plans to the community. We expect them to be joined by the the project manager and a representative from the company that is awarded the contract. There will be an opportunity to ask questions about both the design and the construction plans & timetable. We had hoped to hold the meeting at Bishop itself, but it now appears that work will already have begun and that space won’t be available. We have confirmed the availability of the King school, but are awaiting final confirmation that this location will be suitable for the presentation. Watch for updates here. We are planning a second public meeting, mostly likely in June, on progress in planning the academic program and school leadership & governance at Bishop.